This is the second novel by Sudeep Nagarkar..I had read ‘ Few Things Left Unsaid’ and when I heard that Sudeep Nagarkar"s next book ‘That’s the way we met’ is released I immediately ordered it from flip-kart. This is a sequel story of "Few things left unsaid ” - Aditya and Riya who meet as acquaintances, but happen to fall in love….. they parted and again got along. In this sequel “That’s the way we met” their love story is been redefined and remembered once again. 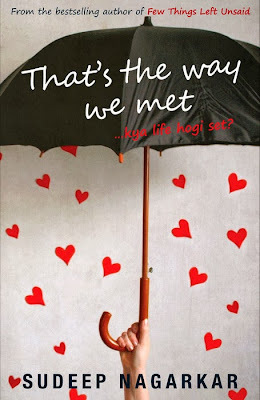 The story of Aditya and Riya moves further with different twists and turns by virtue of destiny in it….to know how and what one has to read “That’s the way we met”. This is the second novel of Sudeep Nagarkar, who has done a good job and justification to this love story. I just loved the way he has mentioned his characters (Mohit & Soman) which seem lively enough. He has explained the beauty of Manali, Rohatang Pass and other places. The author has explained the chemistry between Aditya & Riya really well. The author has expressed intimacy & boldness between the two really well, with no vulgarity in it. Also a lavish Punjabi wedding is a very well explained phase of the story. Although the book’s end shows a different aspect of Life & Love which is all together good for any individual … a reader expects either a happy ending of Aditya & Riya’s marriage or a settled future for both in their respective lives.. This is just a suggestion…. Overall if asked I would say...this is a good job done by Author ( Sudeep Nagarkar) but not to the level of the previous one.